A bit bigger signal for you! When out on mobile radio trips I dream about a big signal to shout back at the DX I can hear (SSB). My Elecraft KXPA100 is wasteful, like all class-AB designs. It also needs a healthy 13V+ supply to get a full 100W output, whereas a good car battery drops to ~12.5V when off charge. Some amateur class-AB amplifiers are still in the 1980s with obsolete IRF510 or Motorola RF parts. This page looks at two approaches to avoid these problems. One is a better class-AB, the second a new concept. Below is a frequency spectrum of a simulation running at 25% modulated power, 7.15MHz. The spurii looks worse because of the simulation's FFT resolution. For a sanity check I simulated a dc powered output stage against a modulated one -6dB down. The spurs stayed about the same, indicating the simulation’s noise floor is inaccurate. Trying to filter the remaining spurii (in the simulation) produced anomalous results, and convergence issues. This illustrates how circuit simulation has its limitations. 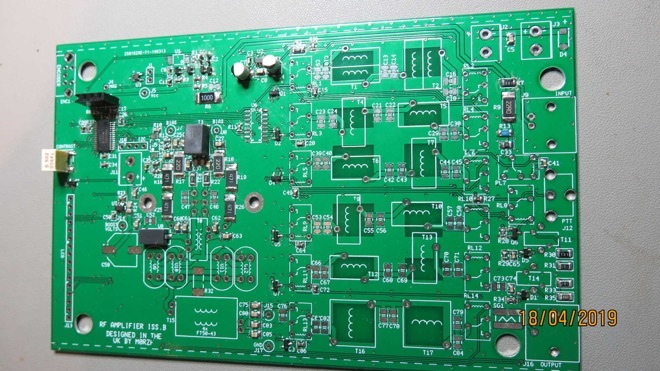 The PCBs and initial components for placement are available for this unique project. Initial tests confirm high efficiency from the power stage, with 65W produced from 13.8V, 5.3A = 93%. Modulating this raw power while keeping safety margins on the FETs is a difficult challenge. If anyone would like to collaborate on this project I can share much more information privately than given here. The new MRF101 LDMOS from NXP provide many advantages over the Mitsubishi RDxx series found in most HF power amplifiers. One major disadvantage - they need about 30V to operate properly. As concluded below, there is no beating transistors designed for high power amplifiers. As a lot of ground-work was already done here in terms of auto-band switching; SWR protection and monitoring; boost power supply; Low pass filters; output transformers, it was decided to have a last push and productionise the best technology and combine with the latest FETs. 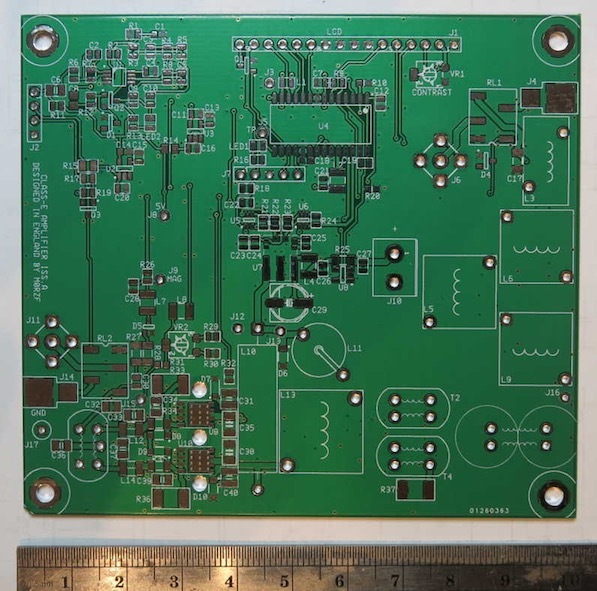 This project should provide a minimal parts count 100W (PEP) amplifier which has several advantages over products like the Elecraft KXPA-100. 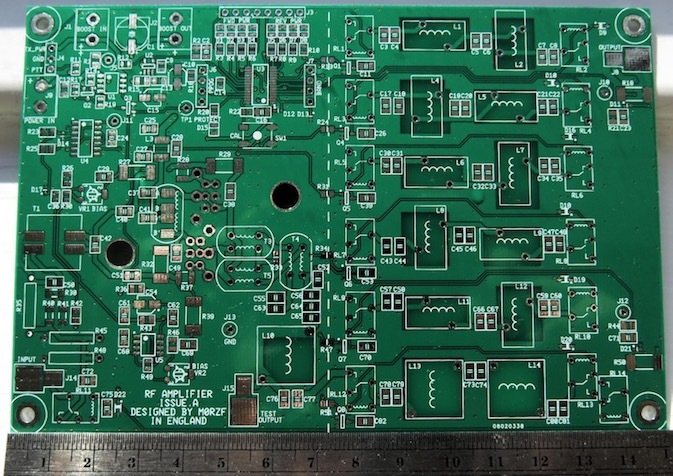 PCBs are under build as shown here. They fit perfectly inside a 160x100mm extruded aluminium enclosure. A previous project was with low-cost (<£1) switching FETs to advance the art beyond the very cheap, barely functional Chinese products on the market. They promise 100W for low cost but cannot deliver half that, and are very crude, not even providing an Rx/Tx relay - buyer beware! Blank PCBs (150x100mm) for the project are as shown here. The amplifier section is on the left, filter to the right. If anyone wants a low-pass as a separate project, it can be split off by cutting along the dotted line! Doubtful linearity with 12V supply, see many rig reviews in magazines! Many were investigated but these TO-220 packaged FETs are best suited - FQP13N10, IXTP2R4N50P. The Fairchild has a track record in citizen band radio output stages. The IXYS FET is obsolete, as Littelfuse acquired and closed the former IXYS semiconductor company. DMOS power FETs can hotspot and burnout under continuous high current. 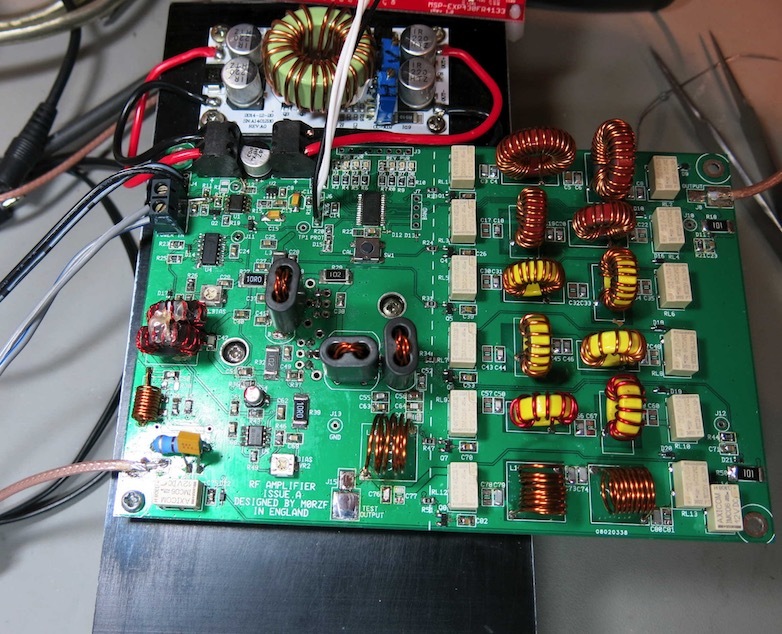 So any amplifier like this must be rated in SSB for higher power than in CW modes like PSK31. Having neutralisation (feedback) from drain to gate is actually a form of bias. Having this allows the no-signal bias to be lower, giving the FETs a chance to drop well inside their forward bias safe operating area during speech pauses. I found the FQP13N10 stable with a heatsink of 1C/W, and bias of 250mA per device. The boost modules use the old TL494 chip from TI. Its dead-time control provides shutdown during receive. The amplifier diagram is here and here. I found IXTP2R4N50P FETs the best overall performers. FETs from St Micro and Infineon were also tested, but the Infineon (IRF520) part gave low gain. The ST part had a serious hot spotting and burnout issue. Here is the amplifier under test, with the Chinese boost module mounted next to the main board. This project is now finished and a mini-movie is on Youtube. The play-safe RD16HHF1 version BOM is here. Software - as mentioned on the video above, the software requires keying to transmit when first powered up. This measures the temperature compensation diodes and calculates the bias offset. Pressing the CAL button during transmit calibrates to the peak transmit power. Fitting a zero-ohm link across R22 forces the board to use a binary code on the BAND connection, instead of automatic band switching. The FQP13N10 works up to 30MHz with 2-3dB less gain than at 3MHz. This is done with negative feedback to swamp Miller capacitance, and careful matching at the input. FQP13N10 gives 20dB+ gain at lower frequencies without compensation. With compensation, 13dB gain at 3MHz and 11dB at 30MHz was measured on prototypes. 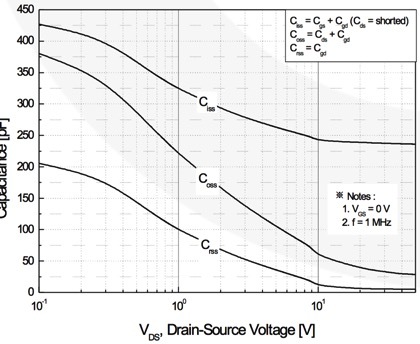 It's important to consider the tradeoff of drain voltage headroom vs. drain-source capacitance. Increasing supply voltage pushes up the impedance and allows optimum choice of output transformer. Using a 1:1 output transformer pushes up peak drain voltage. At 40W into 50Ω, the drain voltage peaks at 64V (assuming zero saturation voltage). Any SWR above 2:1, especially inductive loads, will easily push the crest voltage >100V and blow a 100V FET instantly. This is why FET amplifiers can be sensitive to high SWR. So why not just use a (12V) low voltage supply? The answer is found in this graph. The horrible change of capacitance (Coss) of a FET causes non-linearity. Higher voltage FETs shift the above graph to some extent, so using a higher voltage FET to reduce intermodulation distortion is a trade-off of SWR tolerance against the non-linearity. The IXYS FETs are lower capacitance devices, and work really well up to 30MHz. Unfortunately they are now obsolete. AFTER EXTENSIVE WORK WITH DMOS SWITCHING FETS AT HF, I CONCLUDE THEY HAVE MAJOR DISADVANTAGES!